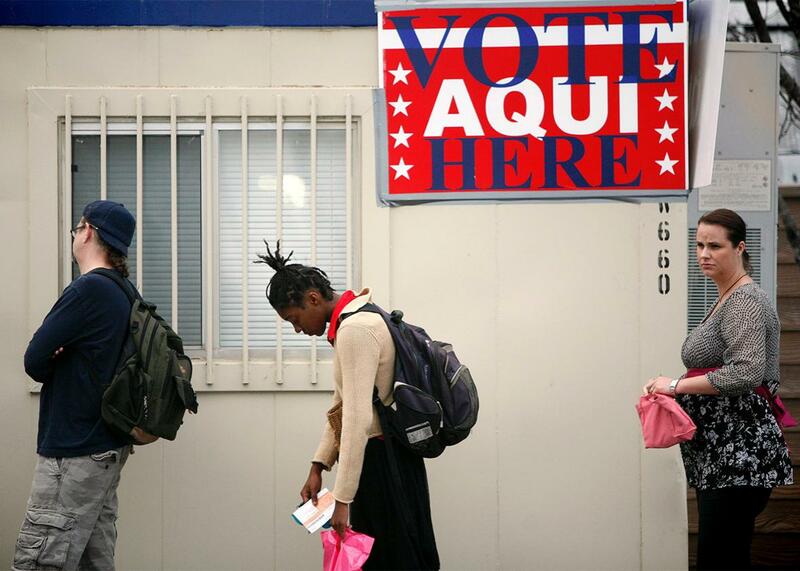 The 5th Circuit left an opening for Texas to lose control of its discriminatory voting laws. Thanks to an appeals ruling, Texas’ discriminatory voting laws could end up under federal oversight. Voters wait outside a polling place held in a trailer at a grocery store parking lot Feb. 19, 2008, in Austin, Texas. This week’s decision by the U.S. Court of Appeals for the 5th Circuit—holding that Texas’ strict voter identification law violates the Voting Rights Act—is good news for those who believe such laws are discriminatory and do nothing to prevent voter fraud. But there is potentially much better news buried within the eight separate opinions of the 203-page ruling, which comes from one of the most conservative courts in the nation. There you’ll find a road map for returning Texas’ voting rules to the supervision of the federal government. That’s something that states like Texas—which has passed laws that handicap a portion of its voting-age population—have proved they still need. Let’s start with the most straightforward part of the 5th Circuit decision. Texas passed one of the strictest voter identification laws in the nation in 2011—a law notorious, for example, for allowing citizens to show a concealed weapons permit but not student identification in order to vote. The suit challenging the law argued, among other things, that members of protected minority groups in Texas, who are more likely to be poor, are also more likely to lack the right kind of identification and to face extra hurdles (such as traveling 100 miles or more) to get a “free” piece of identification from the state. The trial court was ready to throw out the entire law, but the 5th Circuit said such a remedy went too far. The court held that when a trial court finds a law has a discriminatory effect under Section 2 of the Voting Rights Act, it has to keep as much of the law in place as it can while still fixing the illegal part. In this case, the appeals court told the trial court to keep the voter identification law in place but create an alternative means to vote for those who face a reasonable impediment in producing the right form of identification. For example, the trial court may order that a voter be able to vote after signing a form under penalty of perjury saying he faced a larger barrier to get an ID. The appeals court sent the case back to the trial court to figure out exactly how to soften the law. This kind of remedy is a win for the plaintiffs, though it’s not as good as what the trial court proposed by throwing the entire law out. Other states, such as South Carolina, have softened their voter ID laws, but in practice this softening doesn’t always work well, in part because voters and poll workers aren’t aware voters can vote without the right ID if they have a reasonable impediment to getting one. But that softening isn’t the biggest news to come out of the appeals court decision. To find it, you have to read all eight of the opinions together in light of the trial court’s finding that Texas not only violated the Voting Rights Act by passing a law with a racially discriminatory effect but that it also passed the law with a racially discriminatory intent. Upon finding a racially discriminatory intent, the trial court would be free to put Texas back under federal “preclearance” of its voting rules for up to 10 years, the kind of oversight the United States Supreme Court got rid of for a large number of states (including Texas) in the 2013 decision Shelby County v. Holder. The appeals court divided badly in reviewing the trial court’s finding of racially discriminatory intent. Imagine that the trial court found bad intent from two baskets of evidence, Basket A and Basket B. Counting noses, a majority of 5th Circuit judges believed that the trial court’s analysis went too far in inferring discriminatory intent in considering what was in Basket A, such as statements by the law’s opponents in the state Legislature as to the intent of the legislators who passed the bills. But, again counting noses, a different majority of 5th Circuit judges believes that there is enough evidence in Basket B from which the trial court could indeed infer that Texas passed its law to discriminate against Texans who are Latino or black. It sent the case back for the trial court to reconsider the question looking just at Basket B, and a finding of racially discriminatory intent from the trial judge again seems likely. The dissenters suggested that at worst the evidence showed an intention by the Republican-dominated state Legislature to discriminate against Democrats, not against blacks or Latinos. A majority of judges, noting an overlap among racial and partisan groups in Texas, didn’t buy it. In a place like Texas, it makes no sense to separate race and party. As the majority explained, “Intentions to achieve partisan gain and to racially discriminate are not mutually exclusive.” And as one of the judges who believed that evidence from both Baskets A and B proved Texas engaged in racial discrimination put it, if Republicans in the Texas Legislature, out of partisan motives, selected a course of action “at least in part because of, and not merely in spite of, its adverse effects on an identifiable group, that is enough” to show racial discrimination. The upshot is that the trial court on remand could well find that Texas passed its law with racially discriminatory intent. And if that finding gets upheld on appeal, then the trial court is free to require future changes in Texas voting rules to get Justice Department or judicial approval first. Under these preclearance rules, Texas would again have the burden of demonstrating that each proposed voting change would not make protected minority voters worse off. That would be a huge victory for voting rights and a warning to other states not to follow Texas’ lead in making voting harder, especially for more vulnerable members of society.